Just in time for tax season, we’ve released a new tool that’s magic for your email receipts (ex: Uber, Amazon, Walmart, G Suite, Dropbox, etc.). It’s called Get My Receipts, and it works with a single click. Click one button, and we’ll hunt through your entire inbox to find any digital receipts you might have. Like magic, Get My Receipts sifts, sorts, and interprets the data in your email receipts, and then drops the relevant information into a spreadsheet so that you can keep track of things. Get My Receipts is available from the Google Chrome Web Store. It can be installed used by anyone with a Gmail account or an email hosted through G Suite. You’ll notice a new button on the top of your Gmail inbox that says “Get My Receipts.” Just click it and let cloudHQ do all the work for you. You can click on the top right-hand corner icon to check on the progress of your spreadsheet at any time, but we’ll be preparing your spreadsheet and will email you a link once we’re done. The link we provide you in your email, is to your own Google Spreadsheet where you are the owner. We simply generate the report for you. 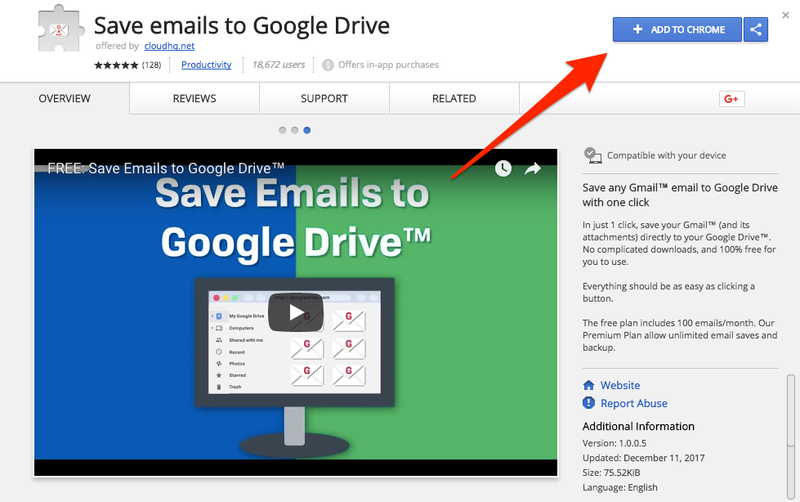 In your Google Spreadsheet, you can access, edit, share, or download it as you see fit. You’ll have up to 50 free email receipt entries in your spreadsheet to see the quality of our work. If you like it, you can upgrade for a small one-time fee which gives you unlimited receipt entries going through the history of your entire Gmail email account. Most of us know the annoyance of digging through Gmail trying to collect receipts for our accountant or to expense items for a recent trip. Get My Receipts makes the process a snap. Click one button and we’ll automatically find, format, and export your email receipts in a way that makes them easy to organize and process. Perfect for tax season or any time you’re updating your finances, Get My Receipts is the latest addition to cloudHQ’s growing library of Gmail productivity tools. We hope you find it as useful as we do! The new look for Gmail first landed in July. It features a redesigned user interface that sports subtle elements of its Material Design theme, plus a host of new features aimed at boosting productivity. This latest update is for Gmail’s web-based email client, which is the PC version. It follows earlier updates to the Gmail mobile app, designed for smartphones and tablets, as well as the Inbox by Gmail app. Besides the larger fonts which help the content stand out and the ever-so-slightly more minimalist appearance, the main difference is a brand new sidebar on the right side of the page. This feature will be useful for those who use Google’s other apps, including Calendar, Keep (a note-taking app), and Tasks (for listing work-related to-dos). Simply click on one of the icons in the sidebar to expand it and open the desired app, and you’ll be able to access it from directly within Gmail. Making these apps more accessible means you can write notes and schedule meetings faster without having to leave your inbox. You can also download additional apps and add-ons from Google’s G Suite Marketplace. Just click on the “+” icon at the bottom of the sidebar. Once downloaded, these will also appear as icons in the new sidebar for your convenience. The new default layout of your inbox provides quicker access to email attachments, as well. You now have the option to open any attachment straight from your inbox without first clicking on the message. But if you don’t like this layout—which can look a bit cluttered—Google offers two alternatives that remove the attachment icons. You can use the “Comfortable” view with messages slightly spaced apart, or the “Compact” view with messages displayed more densely. Many of the features that first showed up in Inbox by Gmail are now integrated into the desktop version. These include the popular “Smart Reply” feature, which you may have already seen on the mobile app. Smart Reply allows you to send frequently used email responses without having to type them out yourself. The reply options automatically show up at the bottom of emails, and you simply click on one to send it. The smart messages are generally short, sweet, and widely applicable. Examples include “Okay, thanks for letting me know,” and “That would be great, thanks.” This feature should be quite useful for anyone who finds themselves spending a lot of time in their inbox. Another new feature—first introduced in Inbox by Gmail—is the “Snooze” button. Now you can temporarily remove messages from your inbox and have them reappear at a later time. With these enhancements to the web-based Gmail inbox, Google says there’s no longer any need for its Inbox by Gmail app, which will be killed off by the end of March 2019. The new Gmail redesign has been slowly rolling out to all users, beginning in April with the Early Adopter Program. If you haven’t seen the new UI yet and want to check it out, click on the settings icon in the top right corner of your inbox. There you should see an option to “Try the new Gmail”. You can also click the same icon in the new UI to switch back to the old one if you don’t like the new look. However, Google says it will automatically migrate all of its users to the new Gmail UI by October 16, 2018, at which point it will kill off the old Gmail for good and prevent users from reverting back to it. To easily save emails as PDFs and store them in Google Drive, install the free Save Emails to Google Drive Chrome extension from the Chrome Web Store. Once you’ve installed the extension, you’ll be able to save individual or batches of emails to Google Drive with just one click. To easily save emails as PDFs in Google Drive, start by installing the Save Emails to Google Drive extension from the Chrome Web Store. In Gmail, choose an individual email, or select a group of emails to save as PDFs in Google Drive. 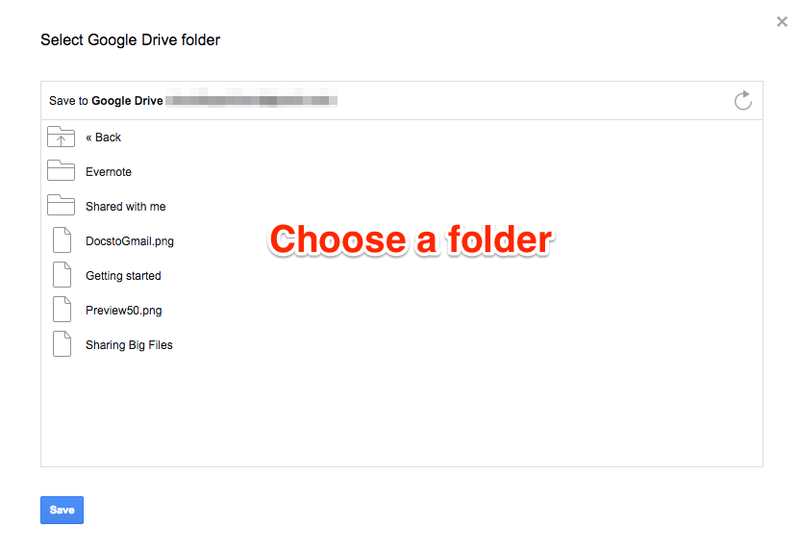 With Save Emails to Google Drive installed, you’ll see a small Google Drive icon in your inbox. 5. Your Emails and Attachments Are Now Saved! Your emails are now saved as PDFs in Google Drive—along with their attachments. There are many situations where saving your emails to Google Drive will be helpful. Here are just a few we’ve seen from people using the tool. Many people now receive most receipts and invoices via email. If you need a PDF copy of all your Uber rides from a recent trip, for example, you can easily save PDF copies of them to Google Drive—then send a link to your HR department for reimbursement. If your legal or HR team has asked for copies of certain emails related to a lawsuit or internal review, you can quickly and easily batch share PDF copies with Google Drive. Finally, saving PDF copies of your emails to Google Drive is a great way to backup any important conversation from your Gmail. From legal communications to personal messages you don’t want to lose, Save Emails to Google Drive can help you keep copies of all your important conversations. You may not realize it. But your email isn’t private. For example, here’s an email from a salesperson. See that notification? It’s showing you that the salesperson is tracking when you open that email. Email senders use this information to watch what you do with their messages. They use that info to send follow-up emails, sales pitches, or donation requests. Email Privacy Protector: Is My Email Tracked? is the solution for anyone who wants to block email tracking. It works by identifying and blocking the trackers that companies add to their emails. You’ll still be able to read and respond to emails normally. But the senders of those emails won’t be able to track your activity. Email Privacy Protector: Is My Email Tracked? is a free add-on for Gmail that’s available from the Chrome Web store. To install, click “Add to Chrome.” The process usually takes less than a second. Once you’ve installed the blocker, you’ll see notifications in your emails telling you if a company is using a tracker, and we think you’ll be surprised when you see just how many of them do. You do not have to actively block email tracking. It will happen automatically after you’ve installed the tool in Gmail. Your Gmail will work normally—and any identified trackers will be blocked automatically. From then on, salespeople, companies, and fundraising teams using email trackers—they’ll each be blocked from monitoring your activity in Gmail. *Pro Tip: If you want to add email tracking to your outbound emails, we have a free tool for you too. It’s called Free Email Tracker, and you can learn more about it here. You told us you wanted more productivity tools for Gmail, and in 2017, we delivered. In total, we released 18 Gmail productivity extensions this year. Of those, 17 are available with robust, 100% free plans—designed to make you more productive with just a few clicks. MailKing lets you send automated email marketing campaigns without ever leaving Gmail. It’s unique because it sends directly from your Gmail account, which guarantees higher open rates for your emails as it reliably lands in your recipient’s inbox, and escapes the trenches of the dreaded promotional tab. ✔️ Salespeople who want to close more deals, faster. ✔️ Marketing emails for small companies and contractors. ✔️ Avid email users who want to be more productive with their emails. Install MailKing from the Chrome Web Store with 1 click. Good Morning replaces your boring new Chrome tab page with an inspirational personal dashboard. Daily inspiration abounds with images that gently remind you to center yourself—along with an inspirational daily quote to help you focus on the bigger picture of your day ahead. Install Good Morning from the Chrome Web Store with 1 click. Gmail Web Clipper lets you save any web articles, texts, and snippets, directly in your Gmail. Everything is neatly saved in a Gmail label directly in your email for you to read later, or for you to send a snippet to someone else. Install Gmail Web Clipper from the Chrome Web Store with 1 click. Perfect for salespeople, customer service reps, headhunters, and more! Install Free Email Tracker from the Chrome Web Store with 1 click. Gmail Phone gives you a dedicated secondary phone number you can provide to clients, customers, or students to keep your personal phone number private. All messages and voicemails will be automatically forwarded to your Gmail account. Great for teachers, small business owners, lawyers, etc. Install Gmail Phone from the Chrome Web Store with 1 click. With Gmail Screenshot, you can take a screenshot, annotate it, and send it directly as a link to anyone who needs to see it. This is a lightweight Chrome extension that will let you snap a picture of anything you see on your screen. Install Gmail Screenshot from the Chrome Web Store with 1 Click. If emails were letters, Gmail Notes would be sticky notes. Highlight a section of an email that you received and make a note about it. Keep it for yourself or email it to someone else. No more having to respond to someone by saying “see edits below in red,” or wishing you could write a note on an email. Just use Gmail Notes and never lose a thought. ✔️ Anyone who wants to make a mental note about an email they received. Install Gmail Notes from the Chrome Web Store with 1 click. Install Free HTML Editor for Gmail from the Chrome Web Store with 1 click. Free Screencast Recording for Gmail captures your voice and any user flows you want to show on your screen. It uploads directly to Gmail, providing your recipient a direct link to your screencast video. Use it for education, customer service—or anything that you want to share that you experience on your screen. 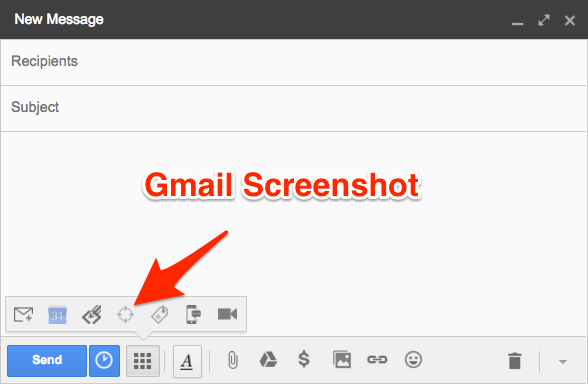 Install Free Screencast Recording for Gmail from the Chrome Web Store with 1 click. With Save and Backup My Emails, you can save emails, email threads, and any attachments to a PDF, Excel, or CSV format. The PDF can be downloaded to your hard drive or your USB key for safekeeping. You’ll feel confident when your emails are literally in your hands. Install Save and Backup My Emails from the Chrome Web Store with 1 click. Ever wish you could just always blind carbon copy another email address when you send emails to a specific person? Maybe it’s to yourself on another email account, or maybe it’s to your assistant, partner, or your CRM! Auto BCC for Gmail does exactly that, automatically. You can rest assured knowing that whoever needs copies of your emails, has them. Install Auto BCC for Gmail from the Chrome Web Store with 1 click. Any time you open an email, Gmail Time Tracker automatically logs how much time you spend reading or writing it. You can then export that information into a spreadsheet. Ideal for employers who want to track the work productivity of their employees, or for professionals who charge hourly; like lawyers, doctors, construction managers, freelancers, and contractors. Install Gmail Time Tracker from the Chrome Web Store with 1 click. You can also upload your video privately to YouTube or Google Drive—or you can download a video file to your hard drive (which then you can send as an attachment). Perfect for salespeople, realtors, lawyers, marketers, and anyone who’s looking to cut through the noise of boring text emails. Install Free Video Email for Gmail from the Chrome Web Store with 1 click. Meeting Scheduler for Gmail lets other people choose a meeting time with you based on your availability. 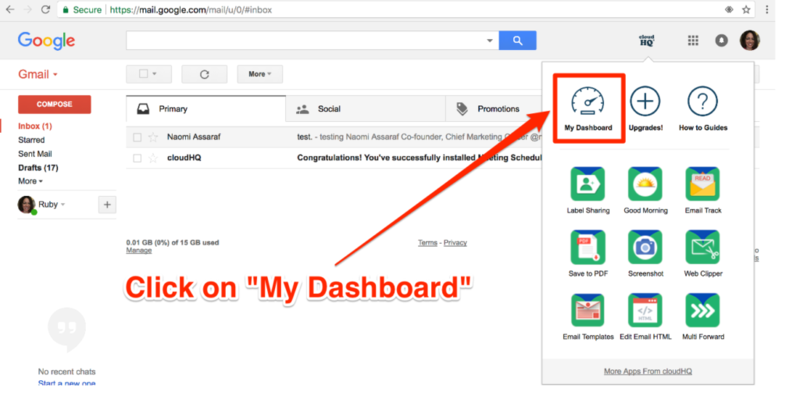 It works directly from Gmail and is 100% integrated with your Google Calendar. Say goodbye to the email “tag game” for scheduling appointments and do everything with one email, and one click. Install Meeting Scheduler for Gmail from the Chrome Web Store with 1 click. Have you ever received an email whose subject is unclear and you wanted to label it properly so you could search for it more easily later on? Rename Email lets you rename email subjects for emails that you received in Gmail. ✓ It can be used to break up a long conversation thread. Install Rename Email from the Chrome Web Store with 1 click. Need to send an email to your client or boss, but it’s 1 a.m.? No worries. Schedule Email lets you schedule your email to send at a later date and time. Install Schedule Email from the Chrome Web Store with 1 click. Sometimes you’re just not ready to read or respond to an email. With Snooze Email, just tell us when you want to see an email reappear at the top of your inbox. Like magic, the email will go away and return at the appointed time. Install Snooze Email from the Chrome Web Store with 1 click. 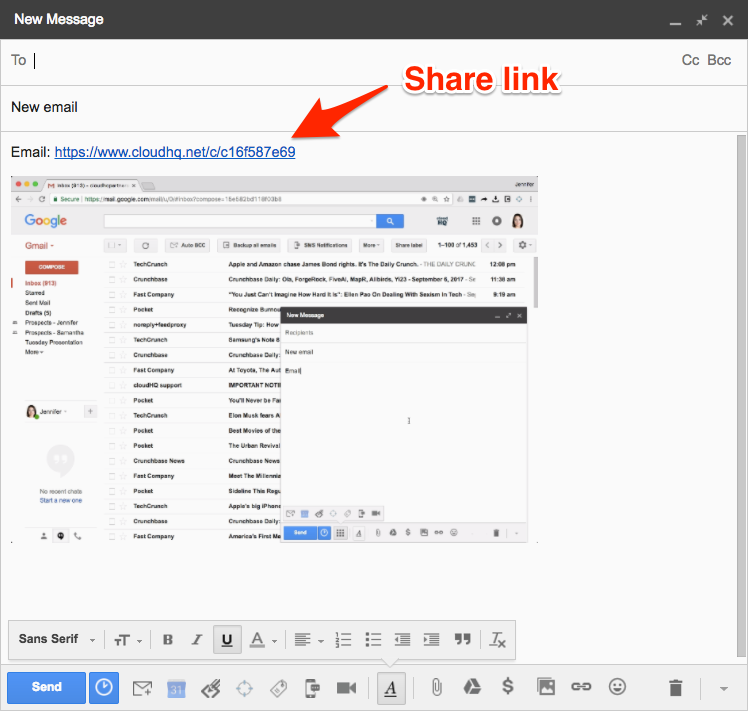 This free extension is an essential Gmail add-on that lets you share an email message that you received as a link. This is a useful tool so that you can post a link to your email on Slack, WhatsApp, Skype, even as a text- use this tool anytime you want someone else to read an email that you received or sent. Install Share Email as Link from the Chrome Web Store with 1 click. Are you a realtor who routinely uses email when scheduling meetings with clients? A journalist who reaches out to experts for interviews? A recent grad trying to impress the HR director at your dream employer? Whatever your situation, in business, you want to make a great first impression. To do that, your communications should be just as professional as your wardrobe, especially when setting up meetings. To help, we’ve just released three new branding features for Meeting Scheduler for Gmail (which is free!). The point of each of these changes? To make you look GOOD the next time you schedule a meeting with a VIP (or anyone!). That will bring you to your cloudHQ dashboard with an entire eco-system of high quality productivity apps at your fingertips. Feel free to take a look at what you have available to you, but for the purposes of pro meeting tips, please click on “Meeting Scheduler for Gmail”. Now pay close attention, because this is where the meat comes in. We’re about to get into 3 top pro tips. For reference, here’s what the “default” Meeting Scheduler landing page looks like, which is still quite professional looking and utilitarian. But…. Let’s see what it looks like with a bit of customization. The first new feature is the ability to add a photo or logo to the landing page. Next, you can change the header color and text to any color you prefer. Finally, you can change the welcome message to whatever you want it to say- usually a nice touch is some interesting news about your company or accomplishments. As you can see, with these 3 pro K.I.T. tips, that meeting scheduler looks really good. And while all our Meeting Scheduler features are free to use for anyone with a Gmail or G Suite-hosted email address, some people would be more comfortable to remove our “Powered by cloudHQ” line at the bottom of the landing page. We understand and support your drive for excellence, and so you can absolutely remove it by upgrading your account to the premium version of Meeting Scheduler for just a few dollars a month. Meeting Scheduler for Gmail is the fastest, easiest, and most professional way to schedule a meeting with anyone—directly from within Gmail. No fancy calendar to set up, no third party downloads, and it supports any of your recipient’s calendar platforms, so long as your calendar is Google Calendar. It only offers meeting times that aren’t already booked on your calendar. A simple link that leads to a polished landing page scheduler! It’s a really nice touch to help you seal the deal. Give it a try, we think you’ll love it! Need international phone numbers for your business? Something for your business cards or website? Gmail Phone now offers international phone numbers starting at just $4.99/month. It’s a major feature upgrade we just released for Gmail Phone. Gmail Phone users can now obtain an international phone numbers for over 20 countries worldwide. Prices for an international number start at $4.99/month. International numbers work the same as U.S. numbers. By default, your new number will behave like an automated personal answering service. Instead of ringing your phone, a call to your Gmail Phone number will prompt the user to leave a voicemail. This is perfect if you want to offer an international contact number for your business—without a lot of expense. In addition to international phone numbers, Gmail Phone now also supports text messages up to 1,600 characters in the U.S., U.K., and Canada. That’s roughly 300 words of space for your contacts to explain their most detailed thoughts and opinions. To make screenshot sharing even easier for you, we just made our free Gmail Screenshot Chrome extension even easier. As before, there’s no need to export the image to an editing program, save it to your desktop, or delete 250 screenshots every few months to clear your hard drive. Just snap it, mark it, and send it. Or, you can now screenshot of just a portion of a Chrome window. Select any part of the Chrome window to take the screenshot. As with the other tools in the window, crop can be done in the browser, without having to open the image in PhotoShop, Skitch, or another editing program. By default, we include both the screenshot and the share link. This gives the person receiving your email options to forward or share your screenshot with others as they see fit. You can also copy and paste the screenshot link into other messaging applications—including Skype, Slack, Whatsapp, Facebook Messenger, or whatever app your team uses on a day to day basis. Gmail Screenshot installs in seconds and is free to anyone using Gmail or an email address hosted by G Suite. NEW! Take a Screenshot. Mark It up. Send. That’s what? Some 20 or 30 clicks just to send a single screenshot? Gmail Screenshot—our latest Chrome productivity extension—can do that in half the time. 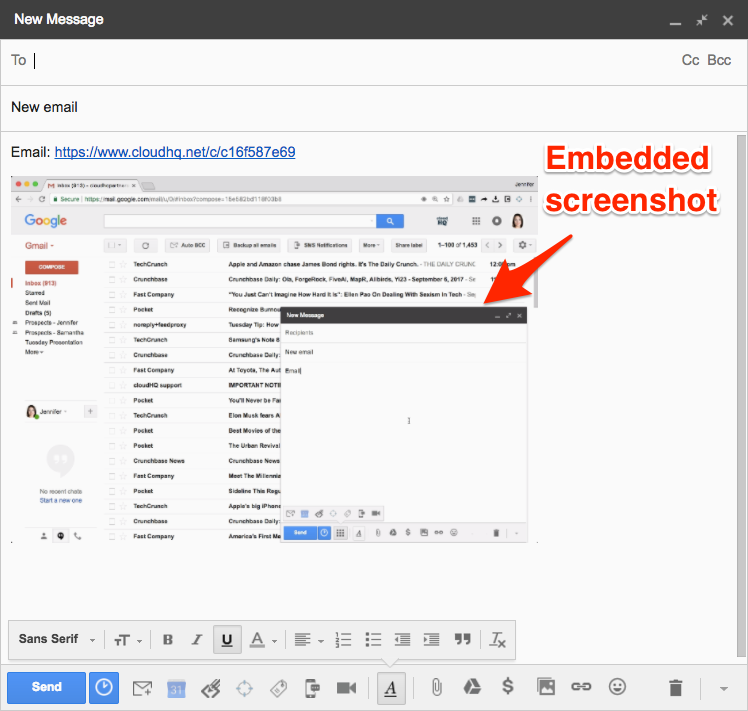 Gmail Screenshot lets you take, annotate, and send screenshots. It’s all within Gmail, and it just takes a few clicks. To start, you’ll need to add the free Gmail Screenshot Chrome extension, which installs in seconds and is free from the Chrome Web Store. Open your Gmail account and click the “Compose” button to open a new email. You can add notes, arrows, or blur areas of the image. When you’re done, click “Share,” and the annotated image will instantly be inserted into your email. Gmail Screenshot is lightweight so it doesn’t slow down your computer, and it’s free for anyone using Gmail or with an email account hosted by G Suite. We love to tear down barriers to productivity at cloudHQ. 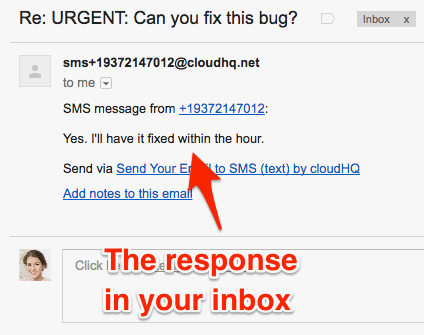 Today we’re pleased to announce a new feature update to our free tool: Send Your Email to SMS (text). 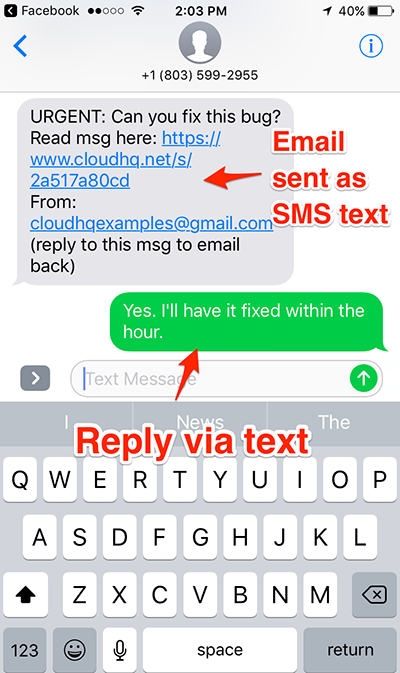 Now, instead of just sending emails as text messages (as you could in the past), you can now receive text messages as emails as well. Then send your email as you normally would. As before, the recipient will receive an SMS text message with a link to your email. Now for the new part. For us, email, texts, and Skype calls are just a way of life as we work to get things done. Send Your Email to SMS (text) helps us prioritize. If Naomi has something urgent she wants to send me, she can send me an email-as-text-message—because she knows that’s the fastest way to reach me. With this new ability to respond by SMS, I can respond to her immediately—without getting pulled into the time black hole that is my inbox. Using text messages can help you prioritize the truly important messages you send at work. They also keep you focused by removing the need to get pulled into your inbox to respond. The extension is free to install for anyone using Gmail.